Hip arthroscopy is a surgical procedure that allows doctors to view the hip joint without making 2 or 3 small incisions (cut) through the skin and other soft tissues, a small camera, called an arthroscope, into your hip joint and the images are displayed on a monitor. Your surgeon uses these images to guide miniature surgical instruments. This results in less pain for patients, less joint stiffness, and often shortens the time it takes to recover and return to favourite activities as compared to an open (larger incision) surgery. Hip arthroscopy has been performed for many years, but is not as common as knee or shoulder arthroscopy. The hip is a ball-and-socket joint. 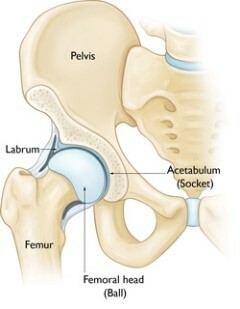 The socket is formed by the acetabulum, which is part of the large pelvis bone. The ball is the femoral head, which is the upper end of the femur (thighbone). A smooth cushion-like tissue known as the articular cartilage covers the surface of the ball and the socket creating a smooth, low friction surface that helps the bones glide easily across each other during movement. The acetabulum is ringed by strong fibrocartilage called the labrum. The labrum forms a gasket around the socket, creating a tight seal and helping to provide stability to the joint. In FAI, bone overgrowth called bone spurs develop around the femoral head and/or along the acetabulum. This extra bone causes abnormal contact between the hip bones, and prevents them from moving smoothly during activity. Over time, this can result in tears of the labrum and breakdown of articular cartilage (osteoarthritis). Hip arthroscopy may relieve painful symptoms of many problems that damage the labrum, articular cartilage, or other soft tissues surrounding the joint. Your treating orthopaedic Surgeon may recommend hip arthroscopy if you have a painful condition that does not respond to nonsurgical treatment such as rest, physical therapy, and medications or injections that can reduce inflammation. Conditions can be treated with Hip Arthroscopy? Your treating surgeon may ask you to schedule a complete physical examination with your physi-cian several weeks before the operation. This is needed to make sure you are healthy enough to have the surgery and complete the recovery process. Tests- Several tests, such as blood and urine samples may be needed to help your surgeon plan your surgery. Medications- Your treating surgeon will ask you to inform all the medications that you take as it is im-portant to stop certain medications for few days/weeks prior to undergoing a surgery. Urinary Evaluations- History of recent/frequent urinary infections and prostrate disease in men mandates a thorough evaluation before surgery. Social Planning - You will be able to walk on crutches/walker soon after surgery. Although you should be independent soon after surgery, depending on your recovery, you may need help/assistance for a few days. Admission- You will most likely be admitted to the hospital one night prior to your surgery. Anesthesia- After admission, you will be evaluated by a member of the anaesthesia team. The most common types of anaesthesia are general anaesthesia (you are put to sleep) or spinal, epidural, or regional nerve block anaesthesia (you are awake but your body is numb from the waist down). The anaesthesia team, with your input, will determine which type of anaesthesia will be best for you. Procedure- The procedure itself takes approximately 2 - 3 hours. Your orthopaedic surgeon will first assess the damage within your hip joint through an arthroscope and then make further small incisions to introduce instruments to repair the damage. Post-Surgery- After surgery, you will be moved to the recovery room, where you will remain for sev-eral hours while your recovery from anaesthesia is monitored. After you wake up, you will be taken to your hospital room. Post–Operative Period- You will most likely stay in the hospital for 2 - 3 days. During this time you will be under supervision of the expert panel of the hospital involved in your treatment. You will be en-couraged to mobilise by the physiotherapy team using walking aids. Positioning-At the start of the procedure, your leg will be put in traction and your hip will be pulled away from the socket enough to insert instruments, see the entire joint, and perform the treatments needed. Procedure-After traction is applied, a small puncture incision is made in your hip for the arthroscope. Through the arthroscope your surgeon can view the inside of your hip and identify dam-age. Images from the arthroscope are projected on the video screen showing your surgeon the inside of your hip and any problems. Once the problem is clearly identified, other small instruments are inserted through separate incisions to repair it. At the end of sur-gery, the arthroscopy incisions are usually stitched or covered with skin tapes. An absor-bent dressing is applied to the hip. Injury to the surrounding nerves or blood vessels, or the joint itself. Traction needed for the procedure can stretch nerves and cause numbness, but this is usu-ally temporary. Pain Management- After surgery, you will feel some pain. This is a natural part of the healing process. Your doctor and nurses will work to reduce your pain. Many types of medicines are available to help manage pain, including opioids, non-steroidal anti-inflammatory drugs (NSAIDs), and local anaesthetics. Your doctor may use a combination of these medications to im-prove pain relief, as well as minimise the need for opioids. Blood Clot Prevention - Your orthopaedic surgeon may prescribe one or more measures to prevent blood clots and decrease leg swelling. These may include special support hose, inflatable leg cov-erings (compression boots), and blood thinners. Foot and ankle movement also is en-couraged immediately following surgery to increase blood flow in your leg muscles to help prevent leg swelling and blood clots. If you have any question concerning your surgery is risk, benefits, likely outcome or complication please do not hesitate to contact a team member at Joint & Sports Clinic. What do they do in a hip arthroscopy? During this procedure, your leg will be put in traction. The hip will be pulled away from its sockets for the surgeon to insert the instruments and perform the surgery. After 2-5 incisions are made around the hip, the surgeon inserts a camera, known as arthroscope into the hip joints to identify the damage and rectify it. Miniature surgical instruments are used to make incisions for surgery. With the help of an x-ray machine, the tools for the procedure are guided to the right part. After finishing the procedure, the incisions are stitched and protected with sterilized drapes to avoid chances of infection. Hip Arthroscopy, thus, reduces the pain, stiffness and recovery time when compared to an open surgery. How long does it take to recover from arthroscopic hip surgery? You can get a discharge on the same day of the surgery if you do not have any complications. Within a few hours of surgery, the patient can go home and take rest. It would be better to have someone to monitor the patient for a day. Sometimes the patients are provided walkers or crutches during recovery. It may take around three months to the maximum to recover from the surgery, depending on the condition of each patient. When can I return to work after hip arthroscopy? You can resume with your normal activities within 10-12 weeks post hip arthroscopy. However, doing vigorous activities like swimming, playing sports etc. should be resumed only after your doctor’s consultation. Physiotherapy is essential to recover from the surgery and to get maximum benefits of mobility and painless life. The doctor or physiotherapist would administer a set of exercises, specifically designed for the patient, for a speedy recovery. How Much Does a Hip Arthroscopy Cost? It can cost around Rs.1.6 lakh or more depending on the centre visited the problem of the patient, anesthesia free and the expertise of the surgeon. The surgery cost can also vary according to the facilities available in the treatment centre of the patient. The patient should be well aware of the advantages and possible side effects of the surgery before going ahead with it.